Do you love spoiling your dogs with new toys? While I do love spoiling our dogs, sometimes toys don’t last long in our household. Some are babied for years, while others are gone in a matter of hours, excitedly loved to death or just not being made well. My biggest problem is that while I don’t mind buying the girls new toys, it gets expensive fast, especially with some of the toys for their size being anywhere from $15 – $30 a toy – yikes! For some reason, I am always on the lookout for well-made toys that are not only safe, but something I think Ivi and Rylie will both enjoy. 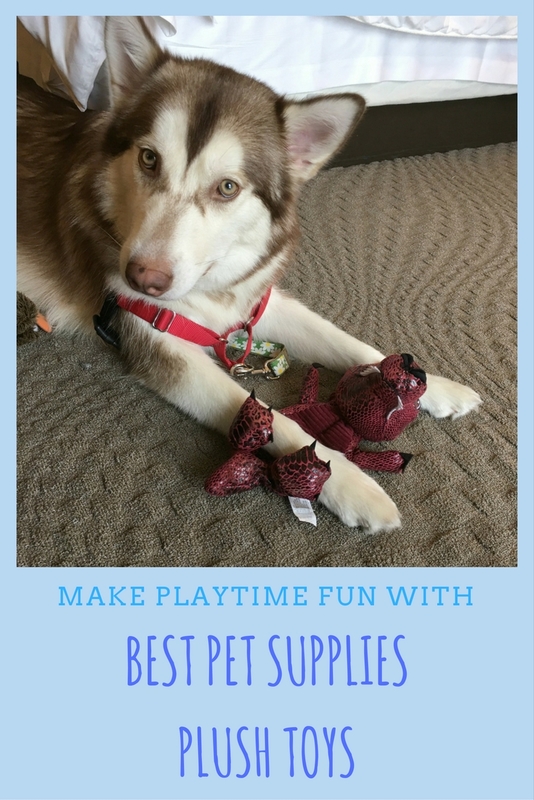 Recently, I was introduced to a new brand that made toys that seemed perfect for curious dogs like mine – Best Pet Supplies Inc. When they asked if I would be willing to review some of their plush dog toys, I couldn’t wait for the girls’ box of test toys to arrive! Best Pet Supplies: Who Are They? Do you love spoiling your dogs with fun, high quality toys? 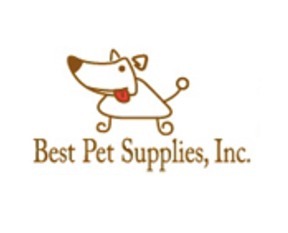 If so, we think you will love the amazing selection Plush Toys from Best Pet Supplies Inc. For those who haven’t heard of Best Pet Supplies Inc, the offer a wide selection of pet products ranging from furniture, toys, treats, safety products, and sanitary products. Their mission is to provide superior supplies at the lowest prices possible, allowing you to keep your furry family members happy without breaking your budget. 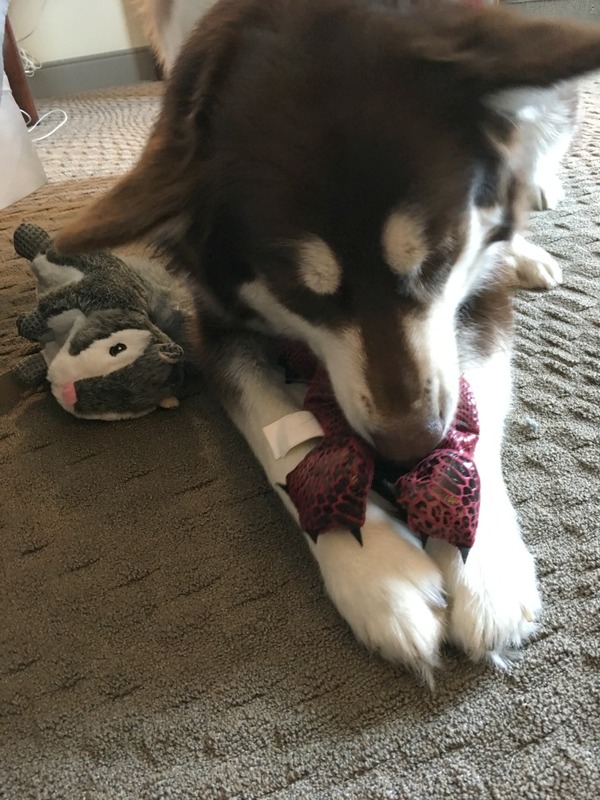 As well, they got out of their way to make unique and fun products to keep dogs busy, like their line of dinosaur, woodland, and other fun plush toys designed to keep dogs busy for hours! Okay, from the moment I opened the box, I thought these toys are absolutely adorable. Don’t get me wrong, I have seen a lot of cute toys for dogs over the years, but the toys from Best Pet Supplies have to be some of the most adorable. So that we could see a good selection of their toys, they sent us some of their 2 in 1 skin toys, dinosaurs, and even wildlife toys so that we could see a good sample of their plush toys. Best of all, the dogs love them. Ivi and Rylie have both between bouncing between the toys, trying to play with all of them and determine which are their favorites. The fact that they seem like they can’t decide, I view as a good sign. As well, the toys are priced to where just about any pet parent can afford these high quality plush dogs toys. If you are looking for great toys on a budget, we high recommend checking out the full selection of toys from Best Pet Supplies Inc. Plush Toys from Best Pet Supplies: Where to Purchase? Want to purchase one of the wonderful toys featured in this review? You can find the full selection of Plush Toys from Best Pet Supplies and other fantastic products for dogs and cats on Amazon.com or Chewy.com! Want to see more awesome dog products? Check out Best Pet Supplies on social media! Oh, so cute! What a nice site. I think sometimes we spoil our fur babbies….and it’s just the thing to do. They give us unconditional love, all the time! 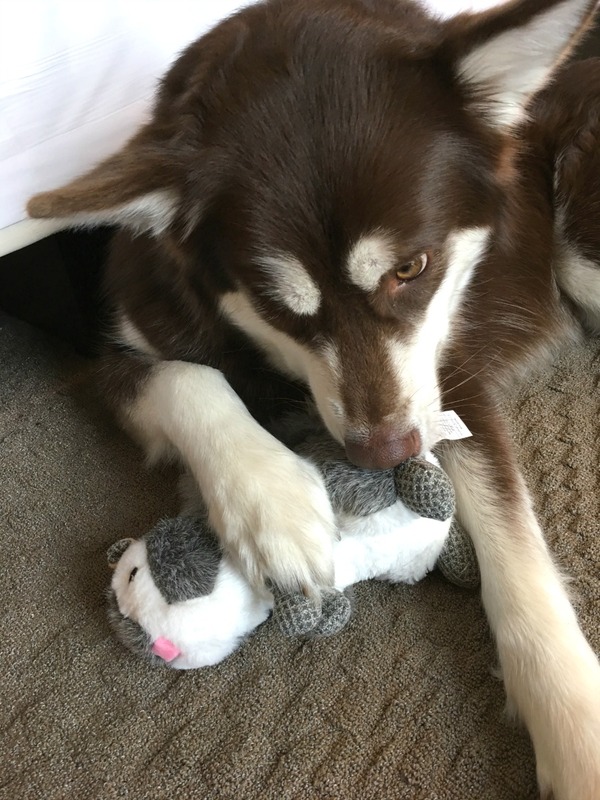 Awwww…..your dogs look like they love, love, love their new toys! I’d love to find one that my dog doesn’t rip the stuffing out of! first thing! She has a squirrel that she loves and doesn’t seem to want to rip it up. Thanks for the review! When dogs like to chew up their toys, it can definitely get expensive! It’s especially true when they love the squeaky toys! My two dogs rip their loveys to shreds! I expected that when they were puppies but now at 5 years and 2 years…they STILL rip them apart! Very frustrating. These look quite durable. Maybe I’ll give them a try! Our pets love their toys. I’m sure they would love some new ones. Dont have a dog but my cat loves a good cat toy! That last photo is so adorable. Our dogs love their toys too. Thanks for posting! Your babies are adorable. Yes, we love to give our little doxie toys. He knows them by name, but like you some last, some don’t. I already use Chewy.com and so happy with the food and treats. I’m getting ready to place an order so I’m going to get him a couple. He’s overdue for some new toys and he will love these I know. Thanks for sharing, it’s great to find out about good products from people who have used them. Now my little guy will be happy like your girls. Thanks!!!!! 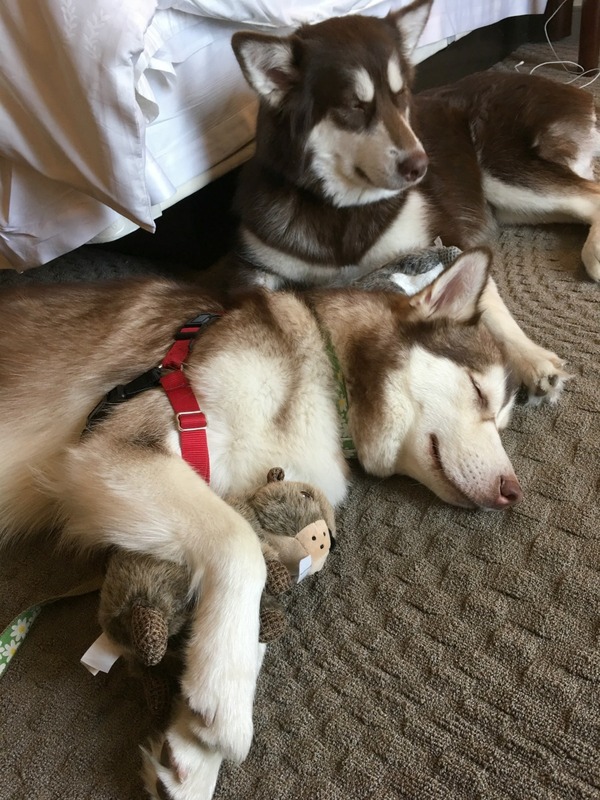 I love it when people take pics of their doggies sleeping with animals – so cute. Growing up we would pose our sleeping cat with our stuffed animals also. I know my sister’s dog would love these toys. These pictures are so cute. I would love to get these, knowing they have really done a good job making them specially for your pets. It is amazing how strong a dog’s teeth are. Must be very careful when buying toys for bigger dogs. They can rip apart more than you realize. My dog has a stuffed dog she sleeps with in her bed. She loved playing tug of war with a rope.